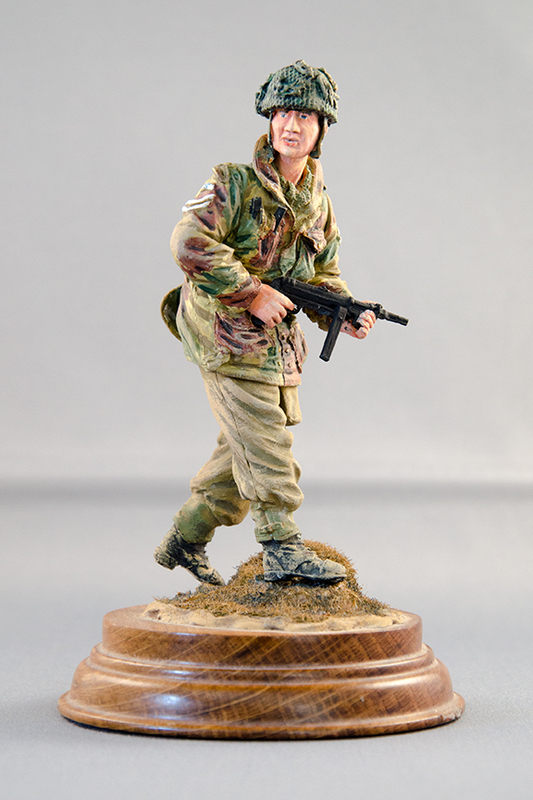 This model represents one of the famous British Paratroopers who fought so bravely at Arnhem, Holland in 1944. Fighting against overwhelming odds, which included some of the toughest troops the German army contained, the SS, the Paras held their ground for days longer than they had been originally been asked to do, as British reinforcements struggled to break through to them at the Arnhem Bridge, forever to be known afterwards as, ‘The Bridge Too Far’. This model is in 120mm and was a one off repair. However Paratroopers in this and smaller scales can be provided upon request. Interestingly, this figure carries a German machine gun, preferring it, as many did, to their own Sten Gun. Similar sized figures can be commissioned from all era’s of history, from Ancient through Medieval, Georgian, Victorian,World War l and modern day conflicts. Please enquire for details.